Email: "Muslims In The USA"
OBAMA said, in his Cairo speech: "I know, too, that Islam has always been a part of America's story. Finally Mr. Obama, where were Muslims on Sept. 11th, 2001? If they weren't flying planes into the World Trade Center, the Pentagon or a field in Pennsylvania killing nearly 3,000 people on our own soil, they were rejoicing in the middle east. No one can dispute the pictures shown from all parts of the Muslim world celebrating on CNN, Fox News, MSNBC and other news networks that day. Strangely, the very "moderate" Muslims who's asses you bent over backwards to kiss in Cairo, Egypt on June 4th were stone cold silent post 9-11. To many Americans, their silence has meant approval for the acts of that day. And THAT, Mr. Obama, is the "rich heritage" Muslims have here in America. Thanks for sending this my way. Unfortunately, whoever wrote this is missing an important lesson in American history. The fact of the matter is that Muslims, and more generally, the religion of Islam, have always been part of the American experience. It is true that no Muslims were present at the first Thanksgiving; but it is also true that no Catholics or Jews were present. Are Catholics and Jews not part of the American story? It is true that no Muslims signed the Constitution or the Declaration of Independence; but is also true that no Native Americans signed these documents. Would you contend that Native Americans are somehow not part of America's story because no Native American signed any of these documents? Also, for your knowledge, the Bill of Rights is part of the Constitution, not a separate document. It's really there because of all the Muslim slaves from West Africa who were taken by force to the United States for three centuries, from the 1600s to the mid-1800s. Upward of 30 percent of the African slaves in the United States were Muslim, and an untold number of them spoke and wrote Arabic, historians say now. Despite being pressured by slave owners to adopt Christianity and give up their old ways, many of these slaves continued to practice their religion and customs, or otherwise melded traditions from Africa into their new environment in the antebellum South. Forced to do menial, back-breaking work on plantations, for example, they still managed, throughout their days, to voice a belief in the God of the Quran. These slaves' practices eventually evolved -- decades and decades later, parallel with different singing traditions from Africa -- into the shouts and hollers that begat blues music, historians believe. There are many more stories like this, and I encourage you to do some research on this issue. Where were Muslims during the Civil Rights era? 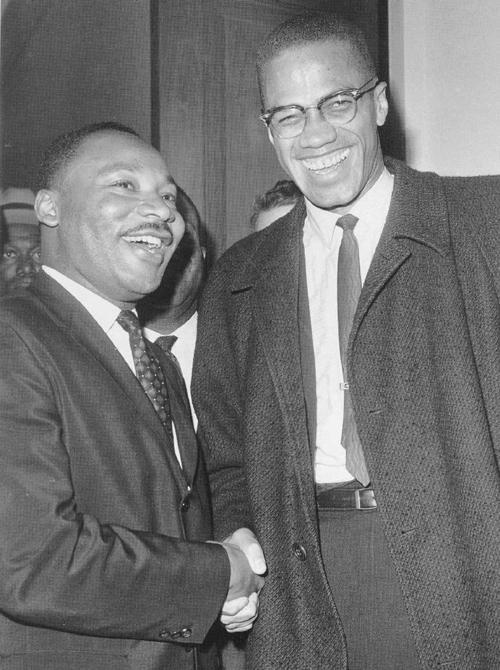 Here is El-Hajj Malik El-Shabazz, also known as Malcolm X, alongside Martin Luther King, Jr. Indeed, he was and still is a a very controversial person, but there is not doubt that he was both a devout Muslim and a strong supporter of the Civil Rights movement. Where were Muslims during World War II? A lot of Muslims were fighting against Nazis. The majority of Allied troops that landed on the beaches of Provence in August, 1944 were "Free French" Muslims from North and West Africa. Thousands of Moroccan and Indian Muslim troops voluntarily served in the liberation of Italy. They risked and gave their lives along with Polish freedom fighters and American GIs at Monte Cassino. Tens of thousands more Soviet Muslim troops bravely served at hellish Stalingrad and Leningrad. All of us should honor and be thankful for their sacrifice in helping end the scourge of Nazism. So as you can see, Muslims have always been part of the American narrative. As much as some people may not like to accept reality that goes against their own blind hate, the facts speak for themselves. If you want to learn about Islam, you really should read things from authors who don't have a clear vendetta against the Islam. Anyhow, I hope this clears up some of the misinformation.